“Our mission is goal attainment. One group simply can’t solve the problem. This is about human lives, often those that are least prepared to protect themselves”, said HG Chissell, Founder of AEG, as he kicked off the Q3 Stakeholder Breakfast event at the Duane Morris office on 20th September 2018. John Gilbert, Chief Operating Officer, Rudin Management Co.
Bob Lurie, EVP, CFO and Chief Strategy Officer, New York Power Authority (NYPA). He then outlined the change in discussion format that is being pioneered across Stakeholder Breakfasts this quarter, wherein each discussion leader will present a problem statement which would be voted on by the attendees. The statement with the highest votes would be the central point of discussion for the group, from which a 12-month action plan would be created and executed. Introducing the event, Phyllis Kessler, Of Counsel, Duane Morris noted a duality: there is uncertainty around productivity gains from IoT adoption; regardless, IoT will play a pivotal role in the future. 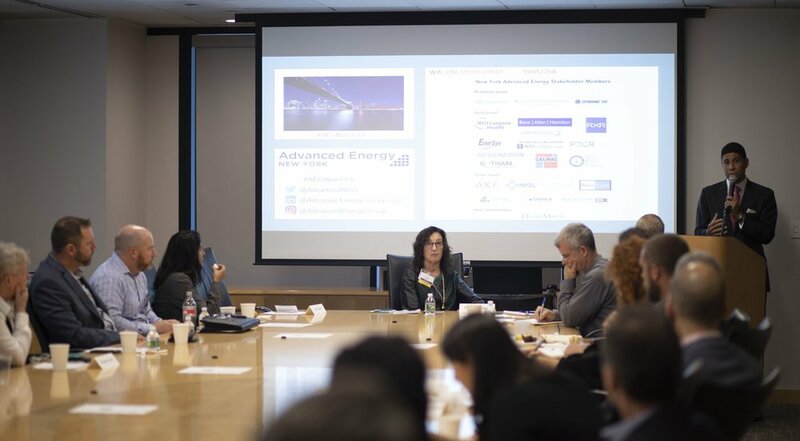 With these remarks in mind, the AEG Breakfast welcomed its first discussion leader, Tria Case, Director of Energy & Sustainability, City University of New York (CUNY). “We need to get the right data to the right people to have a pathway to the mainstream marketplace.” Tria Case made an insightful case about concerns regarding battery technology. She shared how CUNY’s DG Hub was originally intended to share information about solar potential, but they realized battery technology deployment potential was higher. Solar needs to be backed up by batteries for resilience not only in the city, but throughout the grid. Her key question was: What is the data you are seeing that can help decision makers set the parameters for battery storage? Margaret Jolly, Director Demonstration Projects for Customer Energy Solutions at Con Edison, shared how critical it is to “create templates for data sharing, IP licensing, etc.” While data about how the grid is being used will help forecasting, situational awareness and damage assessment, Ms. Jolly suggested development of a platform that could tie in visualization and social media to convey information promptly and accurately to customers. It would also be an opportunity for agencies to synergise and collaborate. For NYC’s “80 by 50,” the grid needs to be green. Using data to manage, identify and track green electrons to green the city is going to be one of the biggest challenges. John Gilbert, Rudin Management Co. Inc. The third discussion leader John Gilbert, Chief Operating Officer, Rudin Management Co. Inc., began by giving a quick demonstration of Nantum, their pioneering proptech software system that has allowed them to cut electric demand in their buildings by 41% and steam demand by about 40%. “Buildings need a brain and we’ve built it,” he said. John Gilbert shared how situational awareness and transparency are key for building owners. In response, they’ve created a Nantum app for smart phones for all actions and services in their buildings.The biggest challenge for them is to give building owners tools that are accessible and impactful, to influence consumption patterns. He also reiterated the urgency to solve safety issues about battery storage by assessing best practices globally. The fourth and final discussion leader was Bob Lurie, EVP, CFO and Chief Strategy Officer of the New York Power Authority (NYPA). NYPA customers are governmental or industrial sectors that typically use low cost hydropower. Bob Lurie shared how transportation creates as many emissions as electricity transmission. He noted NYPA’s ambitions to become an end-to-end digital utility, then asked attendees how they could make instantaneous actionable insight across broader systems in the grid? Networking effect through nodes needs to be applied to the grid, both in supply and demand; only then can the grid be made more flexible and intelligent. He asked stakeholders to consider the best way to communicate and inform customers on green electrons usage. He ended by underlining the need for more collaboration in order to scale beyond ‘pilots’. Stimulating behavioral change by developing the front-end of a shared platform for stakeholders. While attendees felt that data sharing between stakeholders and agencies would lead to the most impact, but there was concern voiced over types of data shared, standards of use of the data itself, and security and accessibility of the platform. Additionally, there was a discussion to potentially scale up a Nantum-like system to include non-BMS buildings (B and C type buildings), as monitoring them and taking steps to reduce building energy would bring about substantial reductions in emissions. John Gilbert shared how simple retrofits and sensors could help drawdown the data necessary to have significant impact on consumption patterns, including stats for temperature, CO2 sensors, occupancy sensors, and smart meters. The group decided to start a shared document with a basic structure of the outcome, create a core working group, and identify clear milestones. The core working group would include but not be limited to Regeneron, Navigant, AEG, and NYPA. The milestones would be to have an agreed upon goal within 30 days and a roadmap of achieving this goal within 90 days. The event concluded with closing remarks and networking. 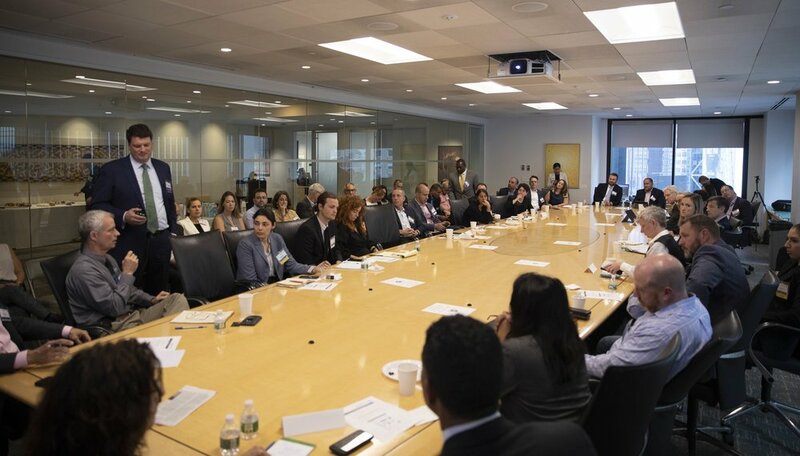 This was a unique opportunity to gather stakeholders in the IoT and Technology ecosystem to identify measurable actions to reduce carbon emissions for New York City. Stay tuned for our regular updates about the progress we make over the next 12 months. Our Q4 event on Mobility and Transportation is on November 29. Register here.